One of my goals for the new year is to manage my time better. I've been a working mom for the last 3 years (aside from maternity leave), and some days I still feel like I have no idea what I'm doing. There are a few tips I've learned along the way for making life a bit easier. Using a Crockpot. This is a lifesaver! Once I got over the fear of leaving it plugged in all day (sometimes I still run home to check on it), I realized how amazing it is! There is nothing better than coming home after a long day of working to the smell of a delicious warm cooked meal that cooked itself! A lot of my friends also make use of a pressure cooker, but I haven't gotten over the fear of them yet, so I can't personally testify to their amazingness. Buying precut produce. I seriously hate taking the time to cut up vegetables. I know that sounds lazy, but I hate the mess, I hate the time it takes, and my veggie cutting skills are subpar at best. Our local grocery stores sell containers of pretty much any precut veggie you could imagine. When you're ready to cook, just dump the container into the Crockpot or pan and you're good to go. Making Freezer Meals. On days off, sometimes I will make meals for the next 2 days and freeze half of it for the future. Some things that I like to freeze are: soups, taco meat, chili, fajita chicken, smoothie ingredients, etc. Making Lunches At Night. I sometimes feel like I have a million things to do in the morning. Getting myself ready, getting my son ready, making lunches, packing bags- along with trying to get to preschool and work on time. Making lunches at night is a small task that takes a huge strain off of my morning. In the morning, I just have to throw his lunch bag into his backpack and go. Shower at night. I simply do not have time to shower in the morning, so part of my night time routing is showering before bed, along with drying and straightening my hair. It makes my morning routine super quick and stress free. Create a skincare routine. I'm 28 and just now starting to really care about my skin. Thankfully time and genetics have been on my side so far, but I'm not taking any chances going into my 30s. I like to exfoliate and cleanse in the shower at night, followed by moisturizing, and then I cleanse and moisturize again in the morning. Also- sunscreen is your friend! I wear SPF year round. Treat yourself. Sometimes you just need a good day at the salon to remind yourself that you matter and you deserve a treat too. I know I have the tendency to spend tons of money on my son, but always put myself last. There's nothing wrong with getting your hair done, getting a manicure or buying a new purse if you can afford it. Creating a routine is the glue that keeps all of this together, and it will benefit both yourself and your children. If you work shift work or have a rotating schedule, it can be difficult to find a routine that works. Being consistent in your day to day activities will help you feel more in control of your life, and slowly you will find a routine that works for your family. I struggled with finding a routine for the longest time and honestly I'm just starting to get the hang of it. 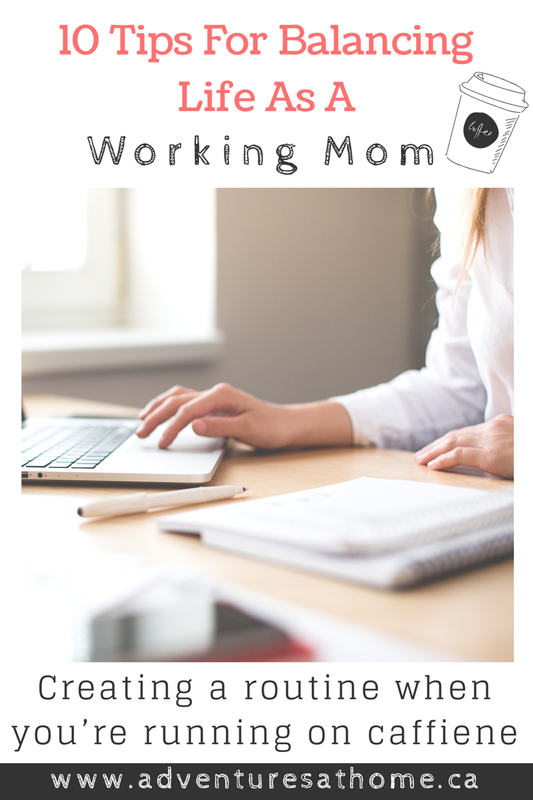 I work full time, but also have my side hustles (writing, blogging, my Etsy shop, etc), so finding dedicated time every week to work on those but still maintain my house and be a mom has been difficult to say the least. I recently came across this saying "Nobody has more time than you. We all have the same 24 hours, some people just manage theirs better." It really made me stop and think about how I manage my own time. I now make sure to get as much work done throughout the day as possible- for both my day job and side hustles. On my breaks or down time at my day job I write articles and blog posts, answer emails, etc. This allows me to have more time at home for cleaning, meal prep, playing with my son, etc. I'm still perfecting my routine, and have a shift change coming up at work soon that will make it a lot easier for me, so I will do a separate post about my updated routine in the coming months. As moms, we tend to feel guilty about EVERYTHING! Being a working mom is especially tough because we have to divide our time between work and our children. I can't count the amount of times I've said to my son "just a minute, mommy's working!" Each time I say it, I feel guilty for not being able to give him all of my attention in that moment. What I'm realizing is that all of this work is because I'm trying to secure a greater future for him. He's 3 years old, so if I'm going to hustle for a better life, the time is now when he won't remember a lot of this. I know personally I can't remember my mom's job from when I was a toddler. I do however remember her working long hours outside of the home throughout my older childhood and into my teenage years. As a matter of fact, she still is. My ultimate goal is to be able to make a full time living from home so I can be there for field trips and family vacations without worrying about using up vacation time or missing out on money. Maybe your career goals look different, but we can all agree that as moms, everything we do is for our children. That is nothing to feel guilty about. I truly believe that it does take a village to raise a child. I know we've had our share of help from our parents and friends when it comes to raising Mason and working full time. There is no shame in asking someone to watch your child for an afternoon if you need to get work done, or asking for advice when you're frustrated. The same goes for work. Working full time in customer service has not been easy for me in terms of finding schedules that work for us, using up sick days, etc. I'm thankful to have found an employer who is very understanding when it comes to a child being sick, or needing to be at daycare pick up at a certain time. While I don't believe that having children should get us special privileges at work, I don't see the harm in asking for what you need (a day shift, paid sick days, etc) and going from there. As a working mom, chances are you already hire help in the form of daycare, preschool, a babysitter, etc. We currently pay more for daycare than we do for our rent, which is why my ultimate goal is to work from home- but daycare is necessary at this point in our lives and we are happy to have it. Help can be hired for other aspects of your life as well. When I get really overwhelmed and feel like I just need to come home to a clean house before I go crazy, I hire a housekeeper. I am currently working on coming up with a good cleaning schedule for myself, but sometimes you just really want someone else to deep clean your house and there's nothing wrong with that. Coming home to a spotless house that has been cleaned by someone else gives me the same feeling as climbing into clean sheets with freshly shaved legs- it just feels good. I have a slight paper addiction. I constantly make use of my planner, sticky notes, desk calendar, clipboard, etc. I need to be constantly keeping track of dates, plans and lists in order to feel somewhat organized. A lot of mom's benefit from a family calendar where you can record all of your appointments and important dates. I tried using a calendar at home but I never actually used it, so a planner was the best way to stay organized for me. I used to have the awful habit of grocery shopping every single day. Immediately after work I would head to the grocery store to get things for supper. After several people pointed out to me that this is a huge waste of time (thanks mom), I've decided that weekly or even bi-weekly shopping trips are a much better use of my time and money. We have a Costco membership where we buy many things in bulk to save on shopping trips as well. Once I got into the habit of making larger grocery shopping trips, I was able to more easily plan my meals around what I bought. As a working mom sometimes it can feel like we're being pulled in a million directions. Between work, home, kids, friends, and family it's hard to find time to get everything done and make everyone happy. Often times we are left feeling flustered and inadequate in many aspects of our lives. A small change that can make a huge difference is just saying NO. Have you ever had a friend call you for a favor, and you just REALLY didn't want to do it? Or had a someone cancel plans and you felt super relieved about it? I know I have. It's not because I didn't want to help someone out or hang out with them, it's because I had SO much going on at the time that the thought of adding one more thing to the list was just exhausting. It's okay to prioritize yourself and your family's needs over someone else's. I'm not talking about emergencies, or someone REALLY needing help- I'm talking about the small stuff. Just say no sometimes. I promise, you'll thank yourself. ...and that everything you do is for them. Make time for play and adventure. Spend time with them without your phone in your hand and separate work from family time. Comment below and tell me your best tips for balancing work and home life! I'm still on maternity leave but still struggle to get everything done! There are pros and cons to living in China, but one pro is that it's affordable to have help so we have someone cook dinner for us twice a week and someone that comes and cleans our apartment once a week. When I go back to work, we'll have a full time ayi (nanny) for Mabel, but I'm still dreading the time away from her and our home! These are a lot of great tips!